WILLEMSTAD – The Pueblo Soberano Prime Minister, Dr. Bernhard Whiteman keeps tight-lipped about the situation in his ruling party. However, the Prime Minister wants to say that he stays as far away as possible from “those things”. 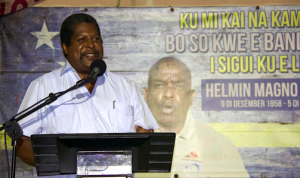 Whiteman refers to the letter sent to the Members of Parliament for his party and the board from the children of the founder and former leader Helmin Wiels. In their letter both the son and the daughter of the murdered leader demand the MPs and the board to discontinue the use of the party’s name. The heirs even went as far as to tell the MPs to find another party to join or form their own political movement. The political leader of the party, Jaime Cordoba indicated this week that they will look for a solution to this problem. Also it is not clear whether Whiteman will be a candidate on the party’s list for the elections on September 30 this year.